I live in fear of weak specification. I consider it the eighth deadly sin: wrath, greed, sloth, pride, lust, envy, gluttony and weak specification. I’m guilty of it, I admit. I’m only human, or, some would say, all too human. I strive to overcome my weaknesses, to improve myself in every way (occasionally) but especially in the matter of weak specification. I try to be diligent, only to find it sneaks up on me. I first heard the term “weak specification” years ago when I read a piece by Flannery O’Connor called “Writing Short Stories” (in Mystery and Manners). One could do worse than sleep with this essay under one’s pillow every night, hoping trenchant wisdom from it will seep into one’s brain and embed itself there, to come out forever after in one’s writing. I was guilty! I committed weak specification in my writing, and half the time I didn’t even know it. But that didn’t matter. It was NO EXCUSE. I determined that I would do better. What O’Connor is referring to by concrete details are sensory details: what can be seen, heard, smelled, tasted, and touched. If the writing is not grounded in concrete, sensory detail—if the words are imprecise or inaccurate—the reader will sort of go dormant, even while “reading.” Haven’t you had this experience? And haven’t you noticed when you’re riveted to the page by the very specificity—we could say strong specification—of the writing? I’m reading Carry the One right now, a fine novel by Carol Anshaw, which I’ll post about when I finish it. I love her writing because it is so highly specified. Because of her details and descriptions, because of the voice that is delivering the observations and descriptions with such aplomb, you cannot glance away. So Carmen was married, just. She sat under a huge butter moon, on a windless night in the summer of 1983, at a table, in front of the remains of some cordon bleu. She looked towards the improvised dance floor where her very new husband was doing the Mexican hat dance with several other large men, three of them his brothers, other Sloans. Matt was a plodding hat-dancer; his kicks threw the others off the beat. In spite of this lack of aptitude, he was waving her over, beckoning her to join in. She waved back as though she thought he was just saying hi. She was hoping to sit out this early phase of her marriage, the mortifying dances segment. Here we have the first moments of this marriage, the first paragraph of this novel, and I ask you: Can this marriage be saved? Don’t you love the butter moon, the cordon bleu, the image of a plodding hat-dancer throwing the others off beat? It’s delicious. Why? Because it’s concrete, specific, original and exact. There is nothing weakly specified about it. Carmen entered the farmhouse by the back door into the kitchen, which at the moment was vacant of humans, going about a life of its own. An ancient refrigerator emitted a low, steady buzz. The pump spigot dripped into a sink whose original porcelain was, in a circle around the drain, worn down to the iron beneath. A fat fly idled around the open window amide dangling pieces of stained glass. The room signed out its own smell—a blend of burnt wood and wet clay. Trace elements of blackstrap molasses, tahini, apples, and dirty socks were also in the mix. As a piece of writing this description is pure pleasure. See how your senses draw you in as you hear, see, and smell. Notice how closely observed it is. “Close observation” is a key concept. It makes you aware that you need not only to see, but to see beyond your first glance, your first look, to really see and experience what you’re describing more acutely, more originally, more specifically. Read the passage again and see just how specific the details are. James and O’Connor would approve. I’m aware in my own writing that sometimes I’ll write a general, generic description or passage. This holds true for memoir or fiction. Mea culpa. I think it has to do with how much goes into writing anything, be in a ten page memoir or essay or a 300 page novel. You’re working with a lot of things, and sometimes you just approximate. In the best of all possible worlds, we would have these greatly developed writing voices that allow us to write passages like Anshaw’s effortlessly, and for all I know she did. But for me–I have to work at it. One of the most fundamental aspects of good writing is that one must be able to specify the world and experience on the page. The imprecise, inaccurate, vague, general, generic—all are anathema to good writing. From a review (NYTBR, Sept. 14, 1997) of Walking in the Shade, volume two of Doris Lessing’s autobiography. I love the line “My forearm smelled of sun.” That’s writing, not remembering. We assume Lessing did lie in the bush at some point. She had that experience. But it’s in the writing of it that she re-enters the experience and makes it come alive and true. This is memoir, but the same thing can occur in fiction. If the writer really puts herself in the scene or moment, really experiences what she’s describing via close observation and alert senses, the writing will come alive. This is the crux of the matter, really. It isn’t “just” that as writers we want the reader to experience what we’re trying to describe. We want those details and shaped reality to carry meaning and judgment, to be telling, readable, and interpretable. In the opening passage of Carry the One, it isn’t just that we’re getting an entertaining description of the wedding party. The selection and specificity of details are telling us what is below the surface, even as the surface captures our attention and draws us into the story. Forcing oneself to observe more closely and write with more precision and originality whatever it is that is being described will open up new insights, ideas, awareness and understanding. As Nabokov said, “Caress the detail, the divine detail.” You start small, close, specific, because that’s where the meaning and resonance really reside. Get the details right, and you’ll get the big things right. A key precept, well said. I think the finest writers all have this in their work, the telling detail. Wow, this is right on! 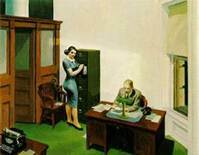 Interesting, your use of the Hopper paintings. Hopper is very specific, yet chooses his specifics carefully. Never more than he needs, but they are powerful. 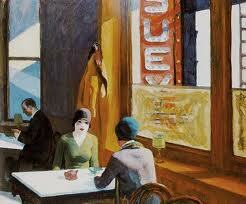 The empty white spaces in the office scene and the "Nighthawks" are specific and filled with emotion, with poetry. Like choosing just the right words. Beautifully put, Don, thank you! I love your description of the white spaces being filled with emotion, with poetry. 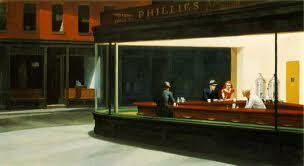 Hopper is so brilliant at capturing loneliness, isolation, solitude, silence. I love his work. I want people to know that you speak with authority, as an artist (and a writer) yourself. Paulette, perhaps you are aware, but I thought of this when reading your reply. Mark Strand has a wonderful little book on Hopper that describes his poetic quality. Now if I could just find it. "Strong specification happens not in memory or imagination (though it may begin there), but in the act of writing itself." You nailed thst, Paulette. I think that's one of the greatest truths in writing and one readers may not realize. The focused work of writing creates story, whether it's memoir or fiction. It's not a matter of stenography but detail and image, rendered through language, pushing the story to something new that couldn't exist without the process of writing. I see you wrote this a while ago, but it was a wonderful explanation of what makes writing compelling! How nice of you to write–and I don't think of the posts as time sensitive (they're eternal!) — I totally agree with you — at least in memoir and fiction, those concrete, sensory, specific, precise details make the writing compelling, and without them, usually the opposite. Thanks for commenting!